tomorrow is pitbull awareness day in nashville and earthdog and kody’s fund are sponsoring the spay station. the spay station will be parked at edgehill village and will be neutering 38 (not a typo...38) pitbull/pitbull mixes. we're proud to be able to fund this amazing event. if you're in the nashville area please come down to edgehill village tomorrow between 11-2. they will also be giving away certificates for no cost spay & neuter surgeries to be done at fix for life. if you've done any foster or rescue work in nashville then chances are high you have or have had a pit bull variety. we have a serious problem with dog fighting and many of the stray dogs on the streets are pit and pit mixes - wonderful dogs that just need a chance. 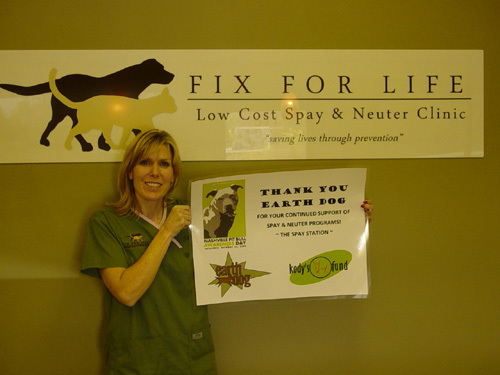 spaying and neutering is a real world solution to an abhorrent problem. this event is a great step in the right direction for nashville.